Austin is a schoolboy with a vivid imagination and a yen for travel. On this particular day, Austin is imagining that he is transported to Australia for the day. He takes his readers on many journeys including riding on a dirt bike, surfing, deep sea diving, and hiking as he traverses the continent. Austin meets a native friend named Alinga and explores with her. They discover indigenous creatures like koalas, kangaroos, sugar gliders and emus. This book is richly illustrated with simple, bright images that invoke lots of details. The whole story is written in rhyme that works for the most part. Targeted for children in grades one through six, I feel it is particularly appropriate for grades two through four. 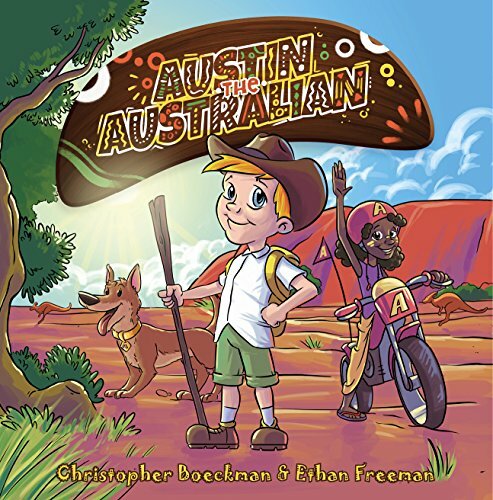 It provides an introduction to life in Australia. This looks super cute! Thanks for linking up at Booknificent Thursday on Mommynificent.com! Austin is a fun, quirky character!